While color printing has become much less expensive for both the home and the home office, color copying has remained pricey. While multiple copies of computer-generated color material can be easily printed, color copying generally involves a trip to the library or local copy center. 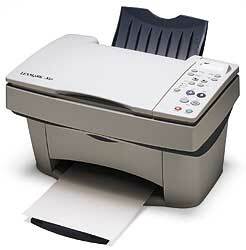 The Lexmark X83 and X73, the latest models in their All-in-One Print Center line make color copying very affordable. In addition, each of these models function as printers and scanners. These two models look very similar and the Lexmark X83 shares many features with its lower priced sibling, the Lexmark X73. 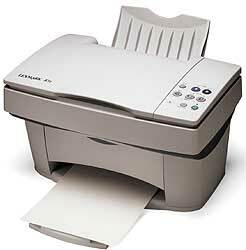 The most critical feature difference between these models is that the Lexmark X83 is capable of standalone copying. This means that all the copying functions (black/color copies, 1-99 copies, reduction and enlargement) can all be accomplished without requiring a PC. The X83 also retails for $199, while the X73 retails for only $149. The X83 prints at up to 12 pages per minute (ppm) in black and up to 6 ppm in color, while the X73 print at up to 9 ppm in black and up to 5 ppm in color. The X73 currently supports the Mac OS, while X83 will be Mac compatible later in 2001. The X83 has a 19,200 dpi enhanced scanner resolution, while the X73 has up to a 9600 dpi enhanced scanner resolution. The X83 copies at up to 10 copies per minute (cpm) in black and up to 3 cpm in color, while the X73 copies at up to 9 cpm in black and up to 3 cpm in color. Deciding between these two models depends on your budget ($50 difference) and if you need to be able to make copies without having your PC running. Reviews OnLine has highly recommended the Lexmark X83 in our review.